This stately custom design exemplifies tradition with its brick exterior, hip roof mixed with gables, arched windows, and dramatic entry. Inside, the foyer is flanked by a formal living room and dining room. Vaulted ceilings expand the living room, family room, and bedroom/study, while a rear deck and a side screened porch extend the home's livable space. 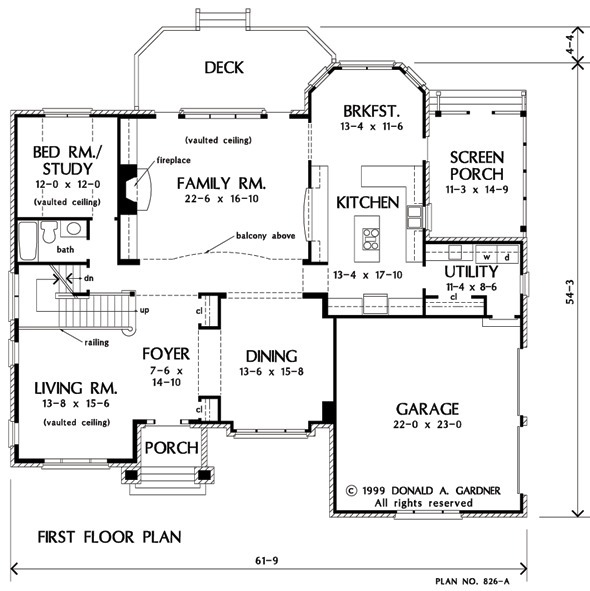 At the top of the stairs, an exciting balcony overlooks the foyer, living room, and family room. Tray ceilings top each of the bedrooms on the second floor, where the master suite enjoys a built-in cabinet, walk-in closet, and lavish bath with his and her vanities. 1st Floor: 2019 Sq. 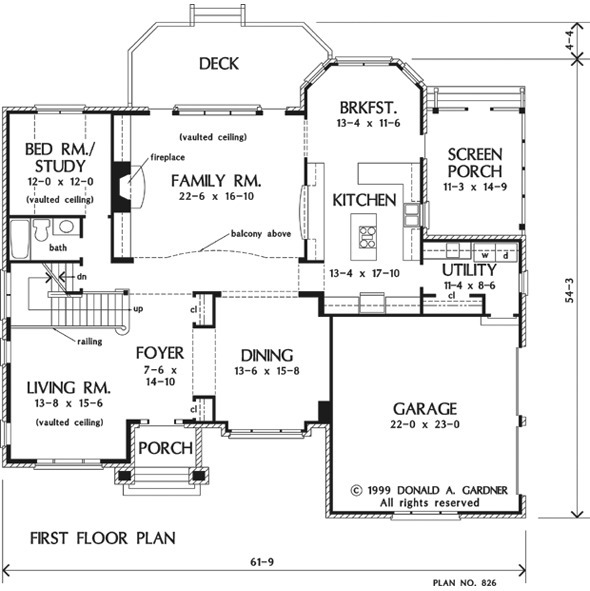 Ft.
2nd Floor: 1296 Sq. Ft.
Porch - Screened: 177 Sq. 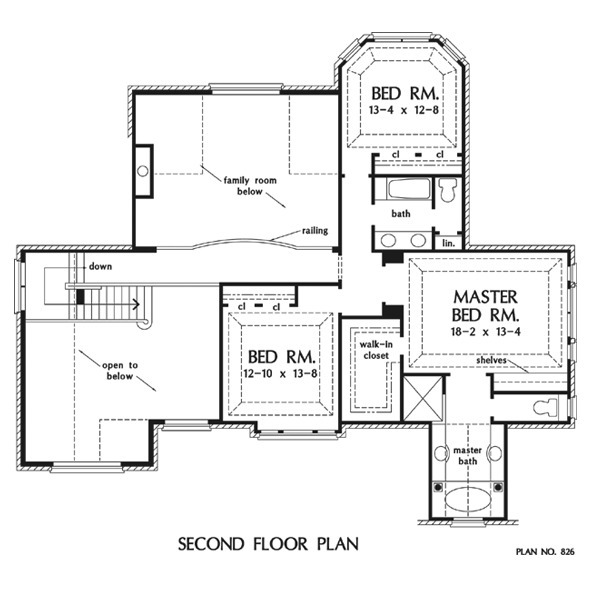 Ft.
House Dimensions: 61' 9" x 54' 3"
Great Room: 22' 6" x 16' 10"
Master Bedroom: 18' 2" x 13' 4"
Master Bedroom (Tray): 18' 2" x 13' 4" x 9' 5"
Bedroom / Study (Vaulted): 12' 0" x 12' 0" x 9' 0"
Foyer : 7' 6" x 14' 10" x 18' 0"
Dining Room : 13' 6" x 15' 8" x 9' 0"
Great Room (Vaulted): 22' 6" x 16' 10" x 18' 0"
Kitchen : 13' 4" x 17' 10" x 9' 0"
Breakfast Room : 13' 4" x 11' 6" x 9' 0"
Utility Room : 11' 4" x 8' 6" x 9' 0"
Bedroom #3 (Tray): 13' 4" x 12' 8" x 9' 5"
Bedroom #4 (Tray): 12' 10" x 13' 8" x 9' 5"
Porch - Front : 7' 9" x 6' 4" x 0' 0"
Porch - Screen : 11' 3" x 14' 9" x 0' 0"
Deck / Patio : 24' 1" x 10' 0" x 0' 0"
Living Room (Vaulted): 13' 8" x 15' 6" x 18' 0"
Balcony : 27' 4" x 4' 4" x 8' 0"